aamra | the power of we | WE launches the world’s first ‘.bangla’ website! WE launches the world’s first ‘.bangla’ website! 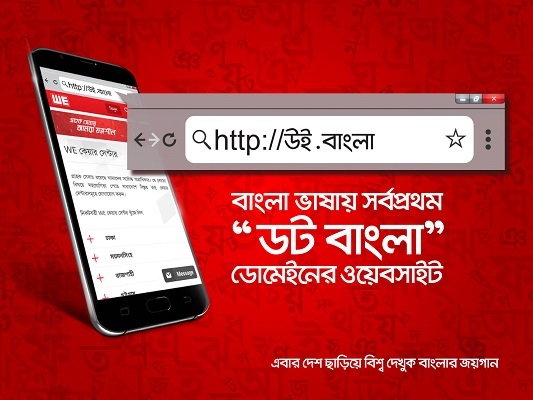 [Dhaka, February 23, 2017] WE, the latest Bangladeshi smartphone brand, has launched the world’s first bangla website under the dot bangla (.বাংলা) domain this afternoon. The site’s address is http://উই.বাংলা, and provides information about WE’s every smartphone along with the details on all the digital services that WE offers with just one-click to the .bangla website link. This unique website was developed by WE Smart Solutions, not only to present WE customers with a convenient information hub on WE products but also to express our gratitude to the martyrs of our country and its hard-fought language through 1952’s language movement protests. WE is a combination of Digital Services, brought together to offer a unique end user smartphone experience to the demanding users of this age. WE is not only a smartphone, but a complete necessity package that gives you access to Free High Speed Wi-Fi Internet across the Country as well as upto 100 GB of Free Cloud Storage benefits. Behind this array of WE’s services is aamra companies – a Bangladeshi group of companies with businesses in IT, Outsourcing, Textiles & Apparels and Professional Development. Safura Tower (9th Floor) 20 Kemal Ataturk Avenue, Banani C/A, Dhaka – 1213 Bangladesh.